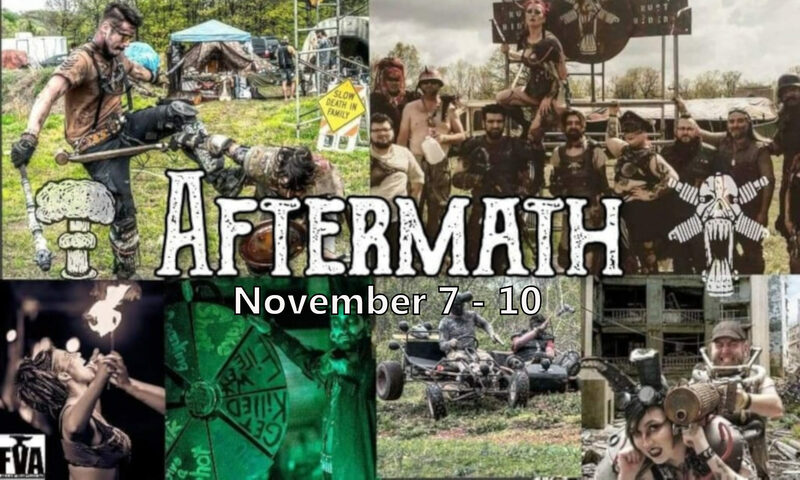 A market area will be set aside for you to set up shop and barter with other Aftermath attendees. Bartered goods can range from costume pieces, vehicle parts, old rusty salvage, or even camping amenities like water or canned food. You are welcome to bring your own camp food to the event, but we ask that all campfires be restricted to established fire pits or burn barrels. 1. All vendor booths must be themed for the event. This simply means that we want to keep immersion going, so we don’t want to see any shiny new display pieces or bright orange nylon tents out in the open. Throw an old burlap covering on your fold-up table or distress your tent, but just make it look post-apocalyptic. 2. All vendors will be responsible for securing their wares and money during the event. Lock your stuff up if you plan to leave your booth. 3. The vendor fee for the whole event is $50. This allows you early entry to set up and access to our special vendor area for the entire weekend. No food vendors, please, as we have that covered. 4. If you’re interested in selling your wares and want more information, contact us at shawn@aftermathevent.com to be approved. 5. All vendors MUST be approved before setting up and selling at the event. The vendor approval deadline is November 1, 2019.